Bangkok’s new Suvarnabhumi Airport has been mired by problems since its opening, including more than 100 cracks on taxiways and runways, corruption claims, inadequate toilets and facilities, and complaints about hygiene standards. Now the question arises whether Suvarnabhumi – assisted by the old Don Muang Airport – is the long awaited answer to the insatiable aviation needs of Bangkok, writes Hubert Croes. 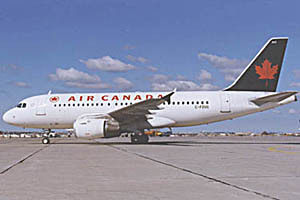 As homage to the pioneers who back in 1937started Trans-Canada Airlines, Air Canada painted one of its Airbus A320 in the genuine metallic colours of its predecessor TCA. A nice unification of a rich history and modern technology, marking Air Canada’s development in sixty years. Being a partner in the Star Alliance, the Air Canada’s modern fleet connects Canada with the entire world. When a Trans-Canada Airlines Lockheed 10A flew from Vancouver to Seattle on September 1, 1937, it marked the first ever flight for the new company. There were only 71 employees at the time. Airline hostesses distributed gum, magazines and even packs of cigarettes to passengers! In 1949, TCA carried more than 21,000 passengers on transatlantic flights, bringing its total number of customers for that year to 685,000. In 1951, TCA introduced service from Montreal to Paris, via Reykjavik and London. Direct flights from Toronto to London started six years later. Tourist Class became available on transatlantic flights in 1952. The airline became the main cargo carrier between Canada, the U.K. and the rest of Europe. In 1957, TCA, also known as Air Canada, had 28,000 miles in route networks. More than two million passengers travelled to 56 cities; including 39 in Canada. On Super Constellations aircraft, individual meals were prepared in advance and served on china and silverware to First Class passengers. TCA officially changed its name to Air Canada in 1965 and embarked on a vast modernization programme that would last the entire decade. In addition to a new logo, the airline offered passengers all kinds of new services, including the first family, youth and seniors’ rates on flights within North America and the world’s most modern reservations system. Service to Florida, Bermuda, the Bahamas and the Caribbean increased passenger traffic by 20 percent. 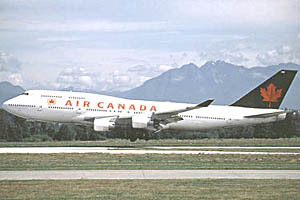 Air Canada was the first North American carrier to offer scheduled service to the Soviet Union. In 1968, the company served 61 destinations and operated 15 transcontinental flights daily. Its earnings totalled $8 million. In 1971, the first Boeing 747 (365 seats) was put into service on a non-stop Toronto-Vancouver route, and then Toronto-London and Montreal-Paris. One year later, to increase customer loyalty among business people, Air Canada started its Rapidair® service between Montreal and Toronto. enRoute magazine began in 1973. On its 40th anniversary in 1977, Air Canada carried more than 12 million passengers and its earnings were $17.2 million. In 1980, 11 million hot meals and snacks were served on Air Canada flights. The company became the 10th largest airline in the world (according to the number of passenger-miles), and British journalist, Egon Ronay, ranked it among the top two airlines servicing the North Atlantic market. In 1984, Aeroplan® – a vast incentive programme for frequent flyers – was launched to help Air Canada maintain its competitive edge in the growing North American market. On its 50th anniversary, Air Canada operated 109 aircraft and one year later, the bill which paved the way for the privatization of Air Canada was passed, opening even more new horizons for the company. In 1991, Air Canada was the first airline to ban smoking on all its flights and later, the first to offer electronic ticketing, on-board telephones and personal TVs. In 1995, following the Open Skies Agreement signed by Jean Chrétien and Bill Clinton, the company introduced 99 direct flights per week to Florida. On December 12, 1996, Air Canada launched a new offensive in the North American marketplace with the official delivery of its first Airbus A319, a modern, cost-efficient aircraft that is perfectly suited to serve dozens of Canada-U.S. Open Skies routes. At the delivery ceremony in Toulouse, Air Canada President & CEO, Lamar Durrett said that the airline was launching a ‘flying competitive advantage’. The A319 is a modern, comfortable aircraft, which flies further, uses less fuel, carries more passengers and costs less to operate. 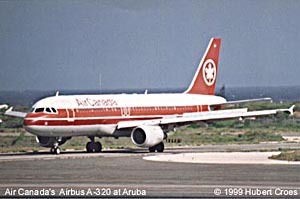 The Airbus A319 provides the airline with a new, cost-efficient and versatile fleet to eventually replace its DC-9 fleet. It offers 112 seats in a mixed Executive and Hospitality configuration, compared to the 132 seats in Air Canada’s current 34-aircraft A320 fleet. On 1 August last year, Air Canada announced that it has signed a letter of intent to acquire eight A330 and A340 aircraft from Airbus Industry, with options for 20 additional aircraft. Air Canada thus undertakes a three-year programme to replace its widebody fleet with fuel-efficient and environmentally friendly aircraft designed to reduce operating costs. Air Canada will take deliverance of five ultra-efficient twin-engine A330-300 high-gross- weight aircraft and three four-engine A340-300 aircraft. The new aircraft will replace its fleet of six Boeing 747-100/200 aircraft and two A340 aircraft currently under operating leases. The new Airbus aircraft will lower operating expenses significantly on the carrier’s long haul routes as well as provide maximum flexibility for a wide range of route structures. Deliveries are scheduled to be completed by August 2000. The second phase would consist of the delivery of five A340-500/600 aircraft, with options for an additional 10, beginning in 2002. Air Canada plans to acquire two A340-500 and three A340-600 aircraft. Once in operation, the A340-500 will seat 308 passengers, while the -600 version – designed for high density or slot constrained markets – will seat 360 passengers. Phase three would see up to eight additional widebody aircraft join the Air Canada fleet beginning as early as 2000. Three of these aircraft would replace the carrier’s Boeing 747-400 fleet, resulting in a standardized widebody fleet and added savings. The decision to implement this phase will be made during 1999. 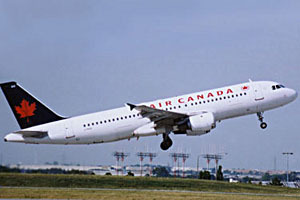 On 19 May last, Air Canada began twice-weekly non-stop service between Montreal and Tel Aviv. The airline already offered the only non-stop service to Tel Aviv from Toronto up to five times per week. With the launch of the new Montreal-Tel Aviv route, Air Canada now offers a daily non-stop service between Canada and Israel. The carrier is operating state-of-the-art Boeing 767-300 aircraft on the new route with seating capacity for 203 passengers. “The key to the economic viability of this service is a consolidated international and domestic operation at Dorval airport. Now that consolidation has happened, Air Canada has the opportunity to launch new air services,” said Jean-Jacques Bourgeault, Senior Executive Vice President at a downtown Montreal business luncheon on the occasion of the inaugural flight. Effective July 2, 1998, Air Canada and Royal Jordanian introduced codeshare service between Canada and Amman, Jordan via London (Heathrow). Under the codeshare agreement, Air Canada is able to offer customers originating from Canada economy seats on up to four Royal Jordanian flights a week between London (Heathrow) and Amman. Conversely, Royal Jordanian customers have access to Hospitality Class seats on Air Canada flights from London to Toronto/Montreal. Co-ordinated schedules ensure fast, convenient, same-terminal connections in London (Heathrow). Another step in the consolidation of scheduled international flights at Dorval airport is the launch, on May 1 last, with Star Alliance partner Lufthansa of non-stop, daily air service between Montreal and Frankfurt. The new service offers the only scheduled non-stop flights linking Montreal and Germany and saves travellers at least two hours over current Montreal-Frankfurt routings via other airports. Air Canada is undertaking the Montreal-Frankfurt route as a joint venture with Lufthansa. In addition to Lufthansa selling seats on a codeshare basis, both airlines are sharing equally operating costs and revenues from the route, thus enabling them to offer their customers the convenience of daily non-stop service year-round. Flights on the new route are operated with Air Canada wide body Boeing 767-300 aircraft. Flights have been timed to ensure the best possible choice of connecting flights to numerous destinations, including Berlin, Prague, Athens and Copenhagen, at Lufthansa’s main hub in Frankfurt. Lufthansa passengers will now have convenient and direct access to Montreal and points throughout Eastern North America. The launch of today’s non-stop service to Frankfurt accelerates the process of building Dorval’s air services. Air Canada’s President and Chief Executive Officer, R. Lamar Durrett has been lobbying for a change in Canada’s policy, which currently restricts airline access to overseas markets while other countries conclude new Open Skies agreements with the United States. As a result, travellers might bypass Canada. Market growth, jobs and economic expansion will go to foreign carriers and U.S. cities instead of Montreal, Toronto and Vancouver. The changes to the international air policy announced by the Minister of Transport, David Collenette, however disappointed Air Canada. The sole new route authority granted to the airline is that from Toronto to Hong Kong. However, initiation of that route cannot begin until Canada and Hong Kong re-negotiate their bilateral air services agreement. Air Canada also welcomed the additional codeshare opportunities, which will enable the airline to strengthen its links with its Star Alliance partners, although the airline is disappointed in the conditions imposed on the exercise of these rights. The minister denied Air Canada’s request to increase its existing Vancouver-Hong Kong service to a daily operation. He also turned down Air Canada’s requests to launch new routes to Amsterdam and Milan, two cities which now do not receive scheduled airline services by any Canadian carrier, as well as rejecting Air Canada’s requests to launch new routes to Taipei and Mexico City. Air Canada is particularly disappointed that its request for authority to initiate service from Vancouver to Taipei was turned down given that it believes the market already exceeds the threshold for second carrier designation under the old policy framework introduced in 1994. Today, Air Canada is Canada’s largest airline, operating a fleet of around 245 aircraft (including its regional subsidiar-ies), and offering more than 1,200 scheduled and charter flights to 120 destinations in Canada, the U.S., the Caribbean, the Middle East and Asia every day. Besides that it offers computerized reservations services to the Canadian travel industry, as well as maintenance, ground handling and training services to other airlines. Air Canada is fully privatized and employs nearly 24,000 people worldwide. This profitable company is valued at nearly $5 billion and is a founding partner of the Star Alliance. This is the first Issue of Aerlines made by our newly inaugurated editors team. I welcome René Graafland, Mark van Harlingen, Edwin Hengstmengel, Alex Klein and Ivanka Pourier as our new regular contributors. I am sure that they will contribute substantially to your reading pleasure. Working together in a team is much fun and very efficient. As we keep an eye on each other, positive criticism, of course benefits the quality of our magazine. Two of our new members had the opportunity to interview Mr. Boubby Grin of KLM Cargo. From what I understood, this was a truly exiting interview. It is a pity I could not attend this interview myself. However, I am happy that we can present you a report of this conversation Alex Klein and René Graafland held with Mr. Grin, who recently joined the distinguished Advisory Board. Further, I invite you to join us in a series about Airport Privatization, a very actual topic discussed by Edwin Hengstmengel. Airports of the World offers you a brief tour around Manchester Airport, that recently has been granted permission to build a second runway. Interested in Asian Aviation? Hans Adriaanse had the chance to fly to the Far East and to explore the world of Asian civil aviation. Sit back and join him in his journey to Asia. More on Asian aviation can be read in Mark van Harlingen’s ‘Thank you for flying Korean Air’. Last but not least, I would like to extend an invitation for all of you, to please, keep the pens rolling and send in your personal contribution to Aerlines. I count on you in making Aerlines an even better and more varied magazine. Never mind your English grammar; we will take care of that! In this first 1997 issue Aerlines starts with the new series ‘Airlines of the World’, in which we try to give a profile of the carrier highlighted. In ‘Airports of the World’ we take a look at traffic and route network developments as well as the way in which the airport prepares itself to enter the next millennium. We decided to take a look at our eastern neighbours and chose Lufthansa – the German flag carrier – and its major homebase and hub, and Europe’s second busiest airport Flughafen Frankfurt. Aerlines also starts with the series the Graduate. This is not based on the well known Hollywood film with the music of Simon and Garfunkel, but on dear Aerius members who finished their degree and now have an aviation related job. We are very grateful that they wish to share their personal experiences with our readers. This time ‘Thank You For Flying’ goes Caribbean! Read about and see some views of the region I was born in. I definitely should go back and take a relaxing holiday! Aerlines wishes to thank J.G. de Wit and ‘Tijdschrift Vervoerswetenschap’ for their kind collaboration with the article on multi airport systems; a topic often discussed lately and about which many discussions will follow in the near future. So be sure to have the knowledge We also thank Alex Kuhlman for his article on easySabre; the most widely used CRS that is also accessible on the Internet with millions of fares updated minute-by-minute. Read more about the opportunities of Cybersales and Cyberauctions . Interested? Check them out! I wish you much reading pleasure.